The Freedom From Religion Foundation, aiming a legal slingshot, is poised to topple a Goliath of discriminatory tax benefits just for clergy for in a much-awaited appeals. 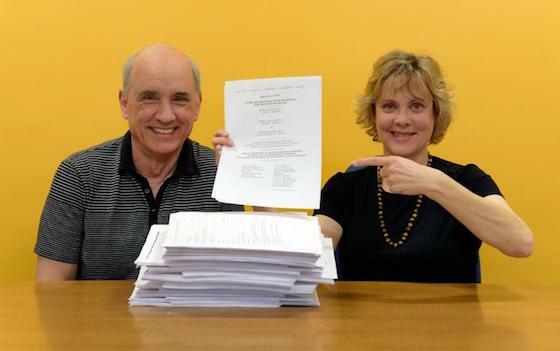 FFRF, a national state/church watchdog with over 33,000 nonreligious members, filed a brief before the 7th U.S. Circuit Court of Appeals late yesterday, in a replay of a case the court last ruled on in 2014. The Department of Treasury and Internal Revenue Service, who are the named defendants, have appealed FFRF’s major court victory before a district court, which last year ruled for a second time in favor of FFRF’s historic challenge of a housing allowance provision in the tax code that uniquely privileges clergy. For several years, FFRF has provided a housing allowance for its co-presidents, Annie Laurie Gaylor and Dan Barker, who are married. They sued, pointing out that the government is singling out clergy for the privilege, while penalizing the heads of a nonreligious but similarly situated nonprofit organization. The 7th Circuit threw FFRF’s original suit out on standing, arguing that Barker and Gaylor hadn't gone through the motions of asking for a refund of their housing allowance from the IRS. Accordingly, they sought the refunds, and when denied refunds for the year 2012, went back to court. Also named as a plaintiff is Ian Gaylor, representing the estate of FFRF President Emerita Anne Nicol Gaylor, who died in 2015 but whose retirement was paid in part as a housing allowance she was not allowed to claim in her lifetime. As FFRF’s brief puts it, “Only ministers can exclude cash housing allowances, a result that is patently unfair.” Even the bible, the brief cryptically notes, commands citizens to “render unto Caesar the things which are Caesar’s.” The government “ignores basic principles of neutrality and fairness when it comes to clergy taxation,” charges FFRF. The brief takes digs at the numerous friends of the court briefs filed against FFRF, representing outraged ministers and denominations as varied as Unitarian Universalists, Jewish, Muslim, mainstream Protestant and evangelical Christian groups, and some 8,000 individuals. “The silence of the amici is particularly noteworthy as none even suggests that expanding the cash housing allowance exemption to non-clergy might be fair. They confirm the value of the exemption, while seeking to confine it to themselves,” contends the brief. The benefit of the tax exemption to the clergy is enormous. The congressional Joint Committee on Taxation has reported that the exemption amounts to $700 million a year in lost revenue. Religion News Service calculated the allowance increases the take-home pay of some pastors by up to 10 percent. "Although defendants try to characterize § 107(2) as an effort by Congress to treat ministers fairly and avoid religious entanglement, the plain language of the statute, its legislative history and its operation in practice all demonstrate a preference for ministers over secular employees," wrote Judge Barbara B. Crabb, for the Western District of Wisconsin, when she decided in favor of FFRF. "The manner in which our housing allowance has been used borders on clergy malpractice," William Thornton, a Georgia pastor and blogger, told Forbes magazine in 2013. "A growing subset of ministers who are very highly paid and who live in multimillion dollar mansions are able to exclude hundreds of thousands of dollars from income taxation." Clergy are permitted to use the housing allowance not just for rent or mortgage, but also for home improvements, including maintenance, home improvements and repairs, dishwashers, cable TV and phone fees, paint, towels, bedding, home décor, even personal computers and bank fees. They may be exempt from taxable income up to the fair market rental value of their home, particularly helping well-heeled pastors. The subsidy extends to churches, which can pay clergy less, as tax-free salaries go further. The case was filed on behalf of FFRF by litigator Richard L. Bolton. Gaylor et al v. U.S. Treasury has case number 3:16-cv-00215.